Early this year in January, Xiaomi announced the ultra-budget Redmi Go, its first ever Redmi device that will be running on Android Go. Today, Redmi has launched the Android device in India and will be sold for just $65. For those who don't know what Android Go is all about, Android Go is a lightweight version of the Android operating system that is designed for devices that has 1GB or less of RAM. This is meant to make the device work without constantly seizing and crashing of apps due to its small RAM and processor size. Companies such as Alcatel, Asus and even Samsung all have an Android Go device. 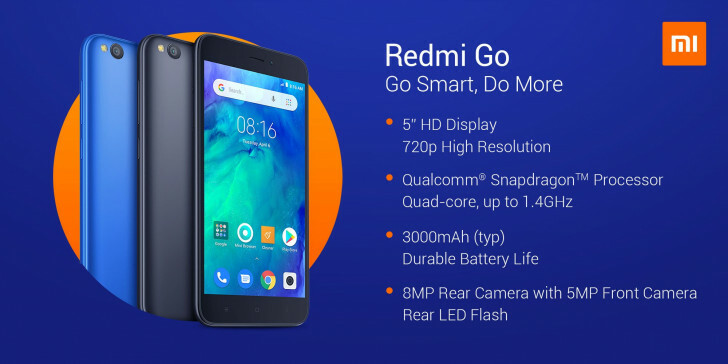 According to the specs revealed by Xiaomi, the Redmi Go device will sport a 5-inch LCD display with 1280x720 resolution. There's an 8MPrear camera that has flash, HDR and as well a 5MP selfie camera for the owner to take some pictures. Packed within the device is a Snapdragon 425 processor, a 3000mAh battery capacity, 1GB of RAM and 8GB of internal storage which can be expanded up to 128GB via microSD card (theres a dedicated microSD slot). Other features includes a dual SIM 4G+/4G standby support, WiFi 2.4GHz, 602.11b/g/n, Bluetooth 4.1, Micro USB, USB 2.0, Dual microphones that has reduces background noise with active noise cancellation. The device will come with Android 8.1 Oreo out of the box and will be available in Black and Blue colours.